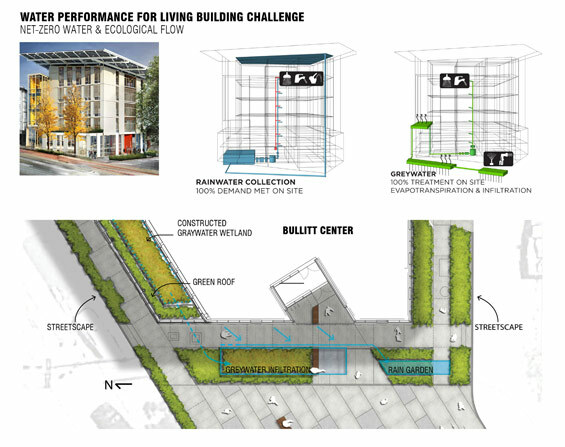 The visionary Bullitt Foundation commissioned the world’s first mid-rise commercial building to meet the Living Building Challenge. 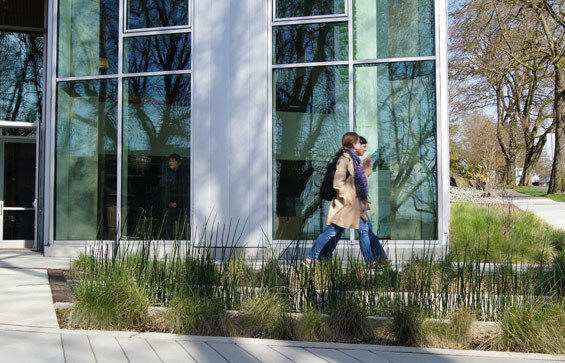 The Bullitt Center now serves as a model for building and exhibiting innovative and ecologically sensitive design and green infrastructure. As landscape architects, we served to integrate the landscape with the building’s wastewater and stormwater systems, and crafted visual and educational connections to the public and building occupants. Each planting area is a functional landscape revealing the natural processes at work. 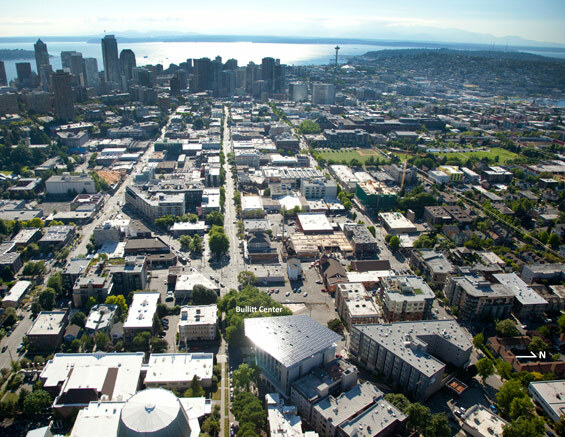 A landmark project, the Bullitt Center redefines the way landscape can serve to support and replace conventional building systems and inspire users. 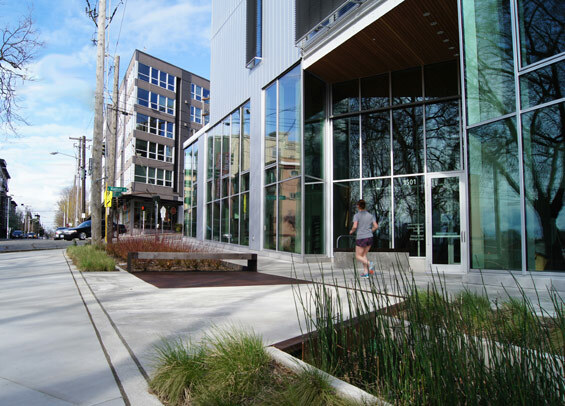 The Bullitt Center, built by the non-profit Bullitt Foundation and heralded as the greenest commercial building in the world, is one of the first buildings to pursue Living Building Challenge (LBC) certification in a dense urban context. The LBC is the most advanced tool to measure sustainability in the environment. It includes seven performance areas (Petals) that are measured by demonstrated performance rather than design models. The landscape contributed to all seven Petals but the two most significant are highlighted below. The Water Petal proved to be one of the most difficult challenges with requirements to achieve Net Zero Water and Ecological Water Flow. To meet these lofty goals the engineers and landscape architect created an innovative water system that loops together rainwater catchment and wastewater disposal with onsite constructed wetlands and rain gardens to store, purify and recharge water to the landscape in an undiminished state. To achieve Net Zero Water, a Living Building must collect all the water the building needs, including potable drinking water. Ecological Water Flow involves treatment and disposal of all greywater onsite, restoring the site’s ecological processes as close as possible to pre-industrial conditions, in this case a Douglas fir forest. Through the use of a 56,000-gallon rainwater cistern and green infrastructure, the Bullitt Center’s water system, much like that of a Douglas fir forest, returns 61% of the water that falls onsite to the soil and atmosphere; no black or grey water is piped to the city sewer. Rainwater collected from the outstretched solar array and roof surfaces is used for composting toilets, sink water and showers. Greywater temporarily stored in a secondary, gravity fed cistern in the basement is pumped in doses every two hours to a constructed wetland and high performance green roof located on the building’s third floor. 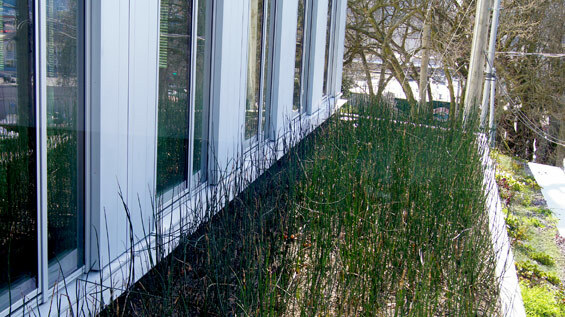 The small 475-square-foot roof landscape manages the herculean task of filtering 400 gallons of greywater each day from this fully occupied six-story office building. Every half hour it is recirculated until it passes through the system four times, allowing the roof to absorb nutrients while cleansing the water to acceptable levels to be returned to the groundwater. The greywater that isn’t lost through evapotranspiration and absorption on the third floor roof flows by gravity to a greywater infiltration planter built in the public right-of-way adjacent to the west side of the building. A very small portion of the site held the characteristics needed to install 40-foot-deep bore trenches to infiltrate the rest of the site’s greywater. As a result, a portion of the infiltration planter had to be integrated with the main public entrance to the building. Here, a custom bench of locally reclaimed timber straddles a steel grate that provides necessary air circulation to the planter without exposing the public to greywater. The nearby rain garden, which runs adjacent to and just south of the infiltration planter, processes the rainwater that sheet flows from the surrounding sidewalk surfaces to avoid overloading the infiltration planter. The Beauty + Inspiration Petal challenges the project to connect site users with their surroundings through history, materials and context. As with the material selections for the building, each plant material in the landscape was required to perform functional benefits as well as reveal the natural processes at work. 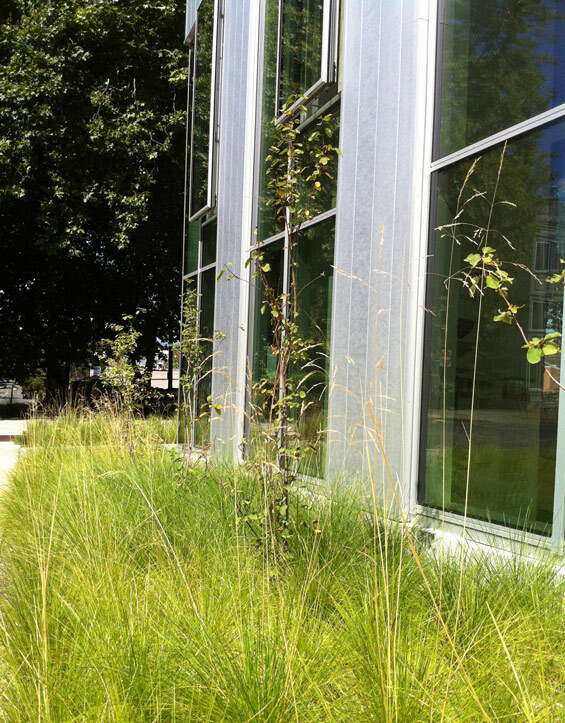 The project’s plant palette provides a softened foreground to the building structure while working hard to cleanse and manage stormwater, thrive in the urban environment, and express how urban ecology is integral to supporting the building’s systems. A native plant palette bridges the functional benefits for the landscape while recalling the site’s original landscape. The durable Woodland and Fern mixes used for the green roof are in response to the unique microclimate of its conditions; mostly covered by the photovoltaic roof canopy above, they receive little to no direct sun exposure. 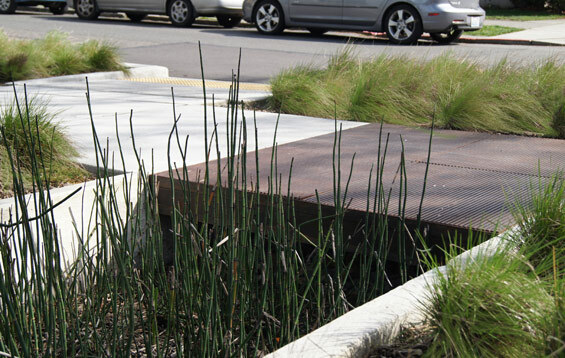 The workhorse of all the green infrastructure systems, the rooftop constructed wetland is planted with Equisetum and Juncus, native plants that aid in cleansing site’s greywater before moving to the ground level. The plant material selected for both the rain garden and greywater infiltration planter were chosen for their high tolerance to fluctuations in water and soil moisture levels and were specifically designed to serve as experiential learning opportunities for those passing by. A dwarf variety of red twig dogwood, an adapted variety of a Pacific Northwest native, was used in the greywater infiltration planter. Plantings for the rain garden include Equisetum and Camas bulbs that will bloom each year around Earth Day. The hardy streetscape to the north is well adapted to shady street-level conditions with groundcovers of Wild Ginger, Oxalis and Sedums, with Salal planted as a mid-level shrub. Ginkgos, known for being extremely long lived and resistant to disease and pollution, were symbolic choices for street trees given the building is expected to last 250 years. The sloping streetscape to the south is tailored to exposed sunny conditions with a grassy understory of Deschampsia and Sedums, as well as a mid-story planting of Amelanchier. Imitation is the sincerest form of flattery. Through investment and hard work, the Bullitt Center boldly pushed the boundaries of acceptable conventions and offers anyone and everyone access to replicable strategies, red listed materials, and real time statistics to rapidly advance the design and governing laws for building truly sustainable structures. Project Team: Bullitt Foundation, Point32, Schuchart, Miller Hull Partnership, PAE Consulting Engineers, 2020 Engineering, Solar Design Associates, Springline, DCI Engineers, RDH Group, Haley and Aldrich, BRC Acoustics & Technology Consulting, Bush Roed & Hitchings.